Manan Ahmed Asif has written aprovocative, though eminently readable, book challenging settled historiographies on Muslim origins in South Asia. ‘Beginnings are a seductive necessity… for the modern nation, the romance of origins and the gravitas of a unique genealogy are imperative,’ Asif declares unambiguously in the opening pages of the book. 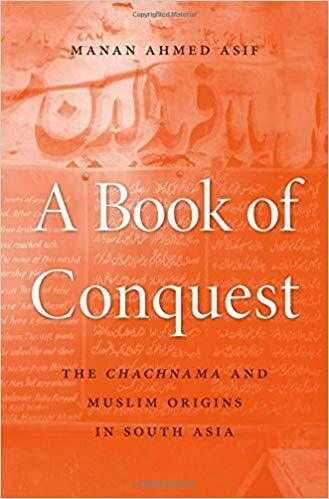 However, the rest of the book is an engaging argument against the dominant narrative, illumined by colonial histories, that Muslim pasts are intelligible only within a singular template of conquests—starting with Muhammad bin Qasim’s victory in Sind, but since then perpetually reproduced at successive moments of arrival. Asif problematizes the imagining of a particular story of beginnings, that of Muslims in India, constructed primarily from the Chachnama—a Persian text written by Ali Kufi in the thirteenth century, which narrates the story of the righteous Brahmin King of Sind, Chach, and the subsequent coming of the Arab army under Qasim in 712 ad. The Chachnama, in a manner of speaking, was in the eye of the storm, as it was made central to the colonialist project of manufacturing an ever-present ‘difference’ between Hindus and Muslims. This was consciously done—to justify the British conquest of Sind in 1843 and portray the English as liberators—by East India Company historians like Alexander Dow, Richard F Burton, Elphinstone and Henry Miers Elliot. Asif argues that by rendering Muslims as perpetual ‘foreigners’ and ‘conquerors’ and Hindus as ‘indigenous’ and ‘vanquished’ in the numerous nineteenth century retellings of the Chachnama, colonial historiography forged an epistemological mould which has held our consciousness of the past in a virtual stranglehold. The two nation theory, espoused with deadly effect in the twentieth century by Jinnah and Savarkar, is the poisoned fruit of the recast-rearranged-refurbished Chachnama. Asif crafts a careful narrative, contestable as it may be, suggesting that Ali Kufi’s Chachnama has been fallaciously interpreted as a book of conquest by evacuating the text of its richness and multivocality, by smothering its political and ethical theory of accommodation, and by locating it in a universal terrain and ridding it of its particularity as a commentary on the reconciliatory mode of thirteenth century politics in Sind. Asif’s book is an argument against origins. It seeks to recover the originary meaning of Chachnama as it appeared to Kufi’s audience by situating it in its temporal and spatial surroundings. Asif breaks fresh ground by claiming that the Chachnama is an original work in Persian and not a translation, as is commonly believed, of an earlier, supposedly eighth century Arabic manuscript, now lost to posterity. It must be mentioned, however, that many renowned historians of medieval India, most notably Irfan Habib, dispute this claim. Nonetheless, in an imaginative leap and by careful historical construction, Asif brings alive the universe of thirteenth century Sind, particularly of the city of Uch, where Kufi had composed the Chachnama in Persian. Therefore, the author makes a persuasive case for re-reading the Chachnama as a thirteenth century text whispering to the land of its composition—a different world altogether, constituted by intimate bonds of commerce and trade, bound together by a unique sacral and material topography, interwoven with the commingling of cultures and communities, punctuated by the continual comings and goings of people within a territorial expanse demarcated by a geography that included Arabia, Kerala, Gujarat and Sind with Uch as the centre of this medieval universe. The Chachnama in Asif’s rendering becomes a text of complex but accommodative political theory, advocating an ethics of reconciliation symbolized in the figures of Qasim and Chach who are both configured as ideal kings. The narrative in the Chachnama begins in the city of Aror, in lower Sind, and it tells the tale of Chach bin Sila’ij, a young Brahmin’s rise to the throne, aided and abetted by the queen who was infatuated with him. Upon becoming the king, Chach conquers the ‘four quarters of Sind’ and establishes a successful polity. Chach also plants trees delineating the territorial extent of his kingdom, thus unilaterally eschewing expansionism. In another notable episode, he allows the Buddhists of Brahminabad to carry on with their religion unhindered after capturing the city and as Asif explains, lays down the foundations of a state based on tolerance. After his death, there is a power struggle between his two sons, Dahar and Daharsia, in which Dahar becomes victorious. Dahar’s polity, after the fashion of his father, is tolerant and welcomes all—including Arabian rebels. This incurs the wrath of the Caliph who sends Muhammad bin Qasim as the commander of the Arabian army to Sind. The second part of the Chachnama is an account of Qasim’s military campaigns in the Sind and the eventual overthrow of Dahar. Asif rehabilitates Qasim as an accommodative figure who follows the policy of accommodation like Chach and is soon able to establish peace with the help and counsel of the former queen Ladi. Qasim’s military campaigns mirror the expeditions of Chach, and he too is described as planting trees on the same spots where Chach had—as a symbolic performance of respecting the sanctity of Sind’s territorial integrity, as defined by Chach. Qasim’s encounter with the idol enshrined in the temple at Aror is somewhat similar to Chach’s magnanimity in dealing with the Buddhist priest at Brahminabad. Qasim mocks the deity and removes one bracelet from its hand, but upon the urging of the priests and the queen lets it be—he is shown as reasonable and willing to accommodate ‘difference’, a far cry from his later imagination as a destroyer of temples. The last part of the Chachnama deals with the death of Qasim by the decree of the Caliph, who is manipulated by the daughters of Dahar into believing that Qasim had molested them before sending them as presents to the royal court. Asif uses this episode in the narrative to examine the rotten sanctum-sanctorum of the Muslim imperium through the characters of Dahar’s daughters—Suria and Piramal—who represent the untainted periphery accusing the corrupt centre. Asif argues that a re-reading of the Chachnama must be based on the entirety of the text. Many retellings had a tendency to ignore the pre-Islamic parts of the text and dismiss it as fiction. The fact that the futuh (conquest) narratives in Arabian literature conventionally glossed over the pre-Islamic period is cited by Asif to corroborate his claim that Ali Kufi wrote an original text in Persian in 1226 ad, wherein he devoted large portions of the narrative to the Hindu polity of Chach and yet cited Arabic sources, such as Baladhuri’s Kitab al-Buldan al-Kabir, only to lend authenticity to his work, as was customary in his day. Hence, the Chachnama is not a book of conquest, or a translation of an erstwhile Arabic manuscript, but rather a work in Persian located in the thirteenth century world of Sind and must be interpreted as such. Asif declares that the Chachnama is a ‘fully Indic text, influenced by texts and genres from Persian as well as Sanskrit, reflecting the intertwined world of thirteenth century Sind.’ Taking his cue from Peter Hardy, Asif understands his endeavour as explicating the Chachnama as a text of Indic political theory, in the genre of advice books that creates a moral genealogy for rule, which attempts to create a framework for reconciling religious difference. It is, most importantly, a text that demonstrates the visible signs of domestication of Muslim rulers in Sind in the thirteenth century, particularly Qabacha of Uch. As is evident from the above point, Asif is proposing a radical re-reading of the Chachnama as a spatially and temporally localized text which bears a specific political theory embedded within the terrain of the Indic, produced by half a millennium of sacral cohabitation and commingling in Sind, from the advent of Qasim in the eighth century to its composition by Ali Kufi in the thirteenth. Asif maps in detail, the curious case of the afterlife of this text and demonstrates how it was rearranged and resurrected by infusing it with an imposed meaning—it was only by a violent uprooting of the text from its context, by forcibly elevating it to a universal narrative of Muslim origins through ahistorical abstraction and misreading, did the Chachnama, under the baton of nineteenth century English historians, become a ‘carrier text’—configured as an exemplar, an exhaustive source of mining for a ubiquitous teleology of ‘difference’ in the trajectory of the many intertwined pasts. Asif’s book is organized into six chapters, all of which are tantalizingly titled, and while the substance of all the chapters has already been covered briefly in the review so far, two chapters deserve special mention as these are illustrative of the central argument in the book. The fourth chapter, ‘A Demon with Ruby Eyes’ discusses how the question of religious ‘difference’ is understood in the Chachnama. The thirteenth century political world of Qabacha’s Uch was heterodox and polyglot, it was a world of sacral difference among the elite as well as the population, as Asif describes. The Chachnama, as a text of political theory, responds to this critical concern by advocating a policy of tolerance and cohabitation between the sacral and the political. Asif argues that the Chachnama negotiates between diverse sacrality, advocates accommodation of different communities and delineates the role of politics in governing difference by demonstrating that a recognition of the sacral power of different communities is necessary for reconciliation and alliance between them. Encounters with ‘difference’ are portrayed by the figures of Chach and Qasim. Chach encounters the Buddhist priest at Brahminabad after the capture of the city and this raises the question of differences within the Hindu polity of Sind under Chach. Upon meeting the priest, Chach is frightened and describes him as a demon with ruby eyes. This encounter with difference leads to fear in the beginning, but later Chach leaves the priest unharmed and asks him to resume his duties at the Buddhist temple, even acceding to his request for repairs and renovations. The recognition of difference is followed by the mutual acceptance of the sacral power of the priest and the political power of the king. The Chachnama thus presents a model of mutual comprehension of difference. Qasim, too, encounters idols in Aror and Multan and is frightened in the beginning like Chach was. The idol at Multan had ruby eyes and the one at Aror was adorned with bracelets of gold and rubies. Qasim removes one bracelet and asks the priest if the idol knows whether a bracelet had been removed. The priest cryptically replies that it is only an idol. Qasim, having demonstrated the incapacity of the idol and the priest having shown the sacral difference come to a settlement where Qasim recognizes the sacral power of the temple and allows it to exist and the priest accepts the political power of Qasim submitting to his rule. In Asif’s explication, ruby eyes represent an agreement between sacral and political power and act as a site of translation and mutual comprehension. Asif further argues that the Chachnama builds on a long genealogy of representations of Indic deities—representing Hindu presence—in Muslim sources and deploys it as a junction of translation between Hindu and Muslim political and sacral powers. Asif concludes that the political theory of the Chachnama is ‘not based on a mutually recognizable theology but on a political and legal understanding of governance’. The fifth chapter bears the mysterious title ‘The Half Smile’, alluding to the myopic characterization of women as limited by their destabilizing sexuality symbolized in the cryptic gesture of the half smile, and consequently invisibilized in the masculine universe of narratives that focus on conquests. Asif exposes the vacuity of the colonial and contemporary readings of the Chachnama by foregrounding the female characters in the text as ethical subjects and custodians of an ideal political theory. Queen Sohan Devi, the wife of Raja Rai Sahasi, is instrumental in the rise of the young Brahmin Chach to power. She falls in love with Chach and conspires to make him the ruler by withholding information regarding the king’s death. She later convinces Chach to marry her despite his vows of asceticism. Asif implores us to read more in Sohan Devi’s persona than a mere enabler for Chach. Sohan Devi carries a clear ethical political theory—that a capable moral person can become a king without having a blood claim. The wife of the slain King Dahar, Queen Ladi proves her mettle when Qasim captures the fort of Aror. He is asked by Qasim to announce the death of Dahar from the ramparts which she does even though she is forsaken as a traitor by the people. Ladi later saves the people of Aror by advising Qasim not to kill them as they were builders and traders who kept the city alive. Qasim later marries Ladi and relies on her acumen and political experience in governing Sind by adopting a conciliatory approach, after the fashion of Chach. Qasim appoints Brahmin advisors of Dahar to key positions without the condition of conversion and allocates a relief fund for traders and artisans who were impoverished by war. According to Asif, benefitting from the tutelage of Ladi, Qasim’s statecraft mirrors that of Chach who himself appointed Buddhist advisors to create an integrated political order. The daughters of King Dahar—Suria Deo and Piramal Deo—in an ironical twist, avenge the capture of their father’s kingdom by scripting the downfall and death of Qasim. The Caliph is portrayed as a licentious and corrupt man who is gifted the daughters of Dahar as a tribute by Qasim. However, upon reaching Baghdad the daughters strategically claim that they have been molested by Qasim and hence are not fit for the Caliph. The Caliph is enraged, and without necessary enquiries, he orders that Qasim be entombed in sheep leather and brought to Baghdad. Qasim—who is barely seventeen years old and is a pious Muslim—agrees unhesitatingly to the Caliph’s wishes and dies in transit to Baghdad. Upon seeing the dead body of Qasim, Suria gives a cryptic ‘half smile’ and bursts into the longest monologue in the Chachnama wherein she admits her lie and absolves Qasim of the charges, but asserts her duty to avenge her father’s death. She lectures the Caliph on the political theory of ethical rule and castigates him for his infirmities of the heart and mind clouded by desire. She also questions Qasim’s blind allegiance to the Caliph and finds him wanting of intellect. Suria and Piramal are constituted as pure ethical subjects in Asif’s reading of the Chachnama and through their gaze the decay in the heart of the Muslim imperium is unravelled. The daughters of Dahar get the final word in the Chachnama and they powerfully extol a political theory based on reason, ethical kingship and the considerations of the interests of the entire polity. Asif is able to convincingly demonstrate that the colonial renderings of the Chachnama as a book of conquest are vastly impoverished and lack the depth and richness that the text hides beneath its many layers. Before we conclude, something needs to be said about the manner in which Asif manages to weave the narrative of the Chachnama with the material history and the sacral topography of the city of Uch. He has travelled extensively and his narrative effortlessly intertwines with the tombs, graves, forts and other important relics of the distant past, strewn around on the visage of Sind. Asif also argues that the Chachnama is a ‘living text’ in the region of Uch and is the life-breath of the cultural fabric, and still an important source of value to the inhabitants of the region. The text that lives on in the collective memory of the people of Uch—the site of its production—bears true witness to the material remains of a common past, of the Hindu presence in the region, of the syncretic landscape that has yet survived the epistemological mutilation of the Chachnama by the colonialist recasting of it as a book of conquest, and as tale of beginnings. Syed Areesh Ahmad teaches Political Philosophy in Ramjas College, University of Delhi, Delhi.